Stems: Ascending to erect, simple or branched proximally. Plants puberulent to pubescent, not glaucous; sap milky. Leaves: Alternate; petiole absent; blade linear, 8 to 24 inches long, 1/50 to 1/25 inch wide, apex acuminate. Inflorescences: Umbel-like cymes, 1-12, mostly terminal, 5-20-flowered. Flowers: 1/5 to 1/3 inch; calyx lobes 5, lanceolate to triangular or oblong-elliptic, 1/12 to 1/10 inch; corolla white, occasionally tinged pink or yellowish green, lobes 5, reflexed, elliptic, 1/12 to 1/6 inch; hoods 5, white, occasionally tinged pink, strongly ascending to erect, 1/16 to 1/12 inch, margins entire, apex rounded; horns needle-like, 1.5-2 times as long as hoods, fused to lower 1/2 of hoods, arching over anther head; gynostegium stipitate, 1/25 to 1/8 inch long, 1/16 to 1/12 inch wide. Fruits: Follicles narrowly spindle-shaped, 1.6 to 3.2 inches long, 1/4 to 1/3 inch wide, smooth, minutely pubescent; seeds numerous, elliptic, 1/6 to 1/4 inch wide; tufted by white to tan silky hairs, 1/2 to 1 inch long. Uses: The Lakota took an infusion of leaves for diarrhea. Comments: Asclepias, for Aesculapius, Greek god of medicine and pumila, dwarf. 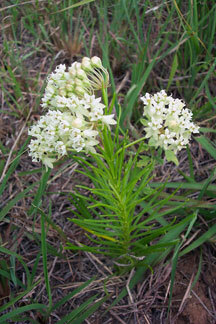 Asclepias was formerly listed in the family Asclepiadaceae, but Apocynaceae, the Dogbane Family, now includes Asclepiadaceae.